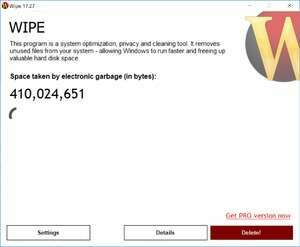 The freeware utility called Wipe cleans all traces of Internet browsing and private usage of the PC. In addition, this freeware software removes private information, such as temporary files, history files or records of recently used files or programs. After starting the program, it offers two cleaning cleaning methods. The option to delete tracks and the option to remove garbage. Version 2017.29 is a freeware program which does not have restrictions and it's free so it doesn't cost anything. For security reasons, you should also check out the Wipe download at LO4D.com which includes virus and malware tests. Additional screenshots of this application download may be available, too.